THE PROBLEM: A teacher has assigned a book report involving the biography of a well-known person. 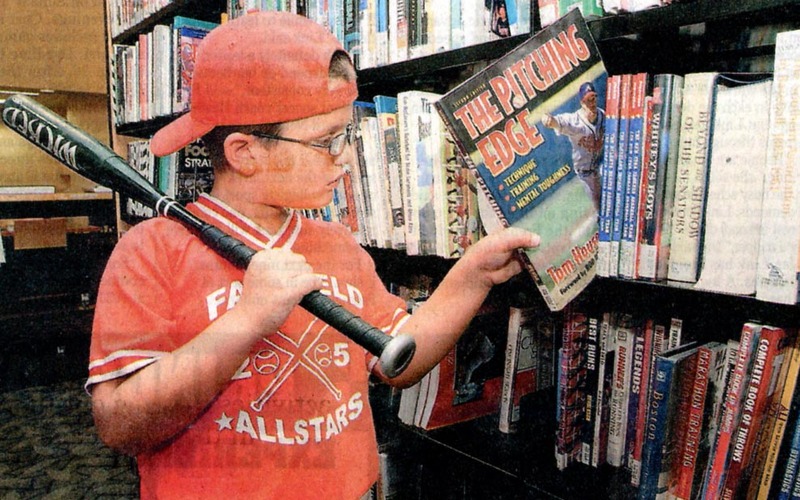 The solution: For many young sports enthusiasts, it's a trip to the library to find a book on a sports celebrity, probably in the student's favorite sport. As a reference librarian at the Fairfield branch of the Lane Public Library, Matthew Cooper has seen the problem and its solution many times. Sports is often popular with youngsters and quickly comes to mind as a potential aid in assignments. In fact, sports is a busy section in libraries. While it does have plenty of sports biographies among it's non-fiction titles, there is much more sports-related material - for youngsters and adults - on the shelves and beyond at the Fairfield branch. According to Cooper, the public may not appreciate the variety of items, including sports, available in contemporary libraries. In a way, "every section of the library is under-used," Cooper said. Browsing and asking a few questions might prove enlightening to quite a few sports enthusiasts, including players and coaches. "It can give you a good groundwork for doing something," Cooper said, adding that patrons should feel free to ask questions. Browsing and searches have their rewards, but there can come a time when talking to a staff member is a good idea. Not only are reference librarians knowledgeable about what is available, they can be helpful in finding things that might be located elsewhere. Books in the Hamilton branch can be available at Fairfield in two days. It takes three days to get it from Oxford. Cooper said librarians can also check on material at other libraries around Ohio. In addition to their immediate purpose, queries about books or other material also serve as one source of feedback for Cooper, who is in charge of an area that includes sports. Throughout the year, he places orders for books, magazines and, recently, DVDs. The library stopped purchasing VHS tapes several months ago. If Cooper identifies interest in a particular sport or topic, he tries to make sure the library has material to meet that interest. Naturally, there is a plethora of material on traditionally popular sports like baseball, basketball, football and soccer, but many other sports are represented, as well. With the growth of fastpitch softball, demand for books and tapes on that sport has led to increased offerings. Golf books have always been popular, Cooper said. Swimming, tennis, and bowling are among the other sports covered. There is even a book with Tony Hawk skateboarding tips. According to Cooper, those who don't use the library probably have some misconceptions about the place. "The library is not just for geeks," Cooper said. "We've got stuff for everybody." Eight-year-old Gage Smith enjoys his trips to the Lane Public Library. Although he is entering the third grade, he reads books up to the sixth- grade level. School libraries have their limitations so going to the local public library opens up more reading possibilities. "I read other stuff, but I think sports is the most interesting," said Smith, a student at Fairfield South Elementary School. Baseball is his favorite sport and Ken Griffey Jr. gets the nod as his favorite athlete. He likes biographies on athletes. As times change, so do libraries. Yes, there are still books on the shelves, as well as magazines and newspapers. In fact, Cooper said about 20 to 25 percent of the Fairfield branch's magazines are related to sports, second only to news publications. Dozens of magazines and various publications are available free of charge on the library's computers through its database and internet connections. "They are portals to an immense amount of information," Cooper said. Some can even be accessed from a computer at home by going through the library's Web page. One of the best things about using the library, Cooper reminded, is the cost, or lack thereof. "Everything that we have here is 100 percent free," he said. "You pay taxes for this. Come in here and use it."